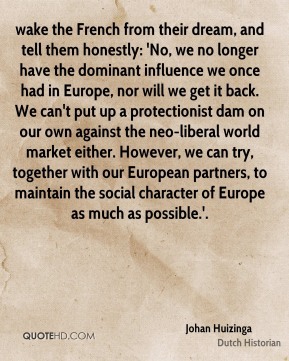 wake the French from their dream, and tell them honestly: 'No, we no longer have the dominant influence we once had in Europe, nor will we get it back. We can't put up a protectionist dam on our own against the neo-liberal world market either. However, we can try, together with our European partners, to maintain the social character of Europe as much as possible.'. The other thing the Internet and overall technology are enabling us to do, quite honestly, is streamline our internal costs, and that's a big deal. 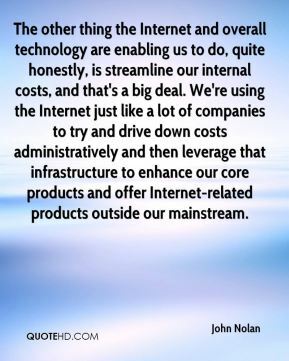 We're using the Internet just like a lot of companies to try and drive down costs administratively and then leverage that infrastructure to enhance our core products and offer Internet-related products outside our mainstream. 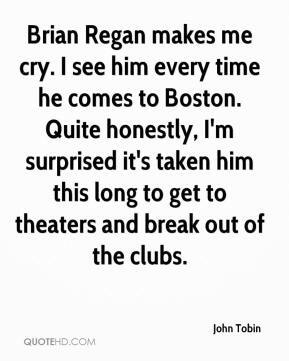 Brian Regan makes me cry. I see him every time he comes to Boston. Quite honestly, I'm surprised it's taken him this long to get to theaters and break out of the clubs. 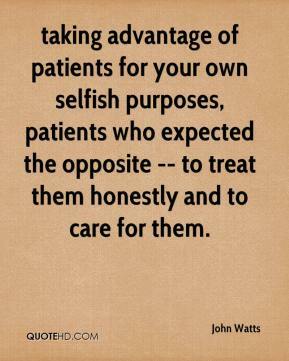 taking advantage of patients for your own selfish purposes, patients who expected the opposite -- to treat them honestly and to care for them. In all honestly, it depends on how long it goes. 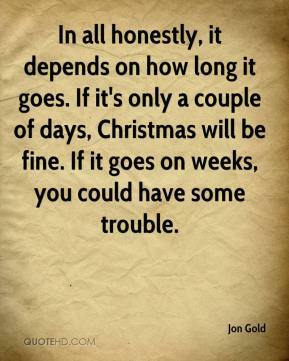 If it's only a couple of days, Christmas will be fine. If it goes on weeks, you could have some trouble. 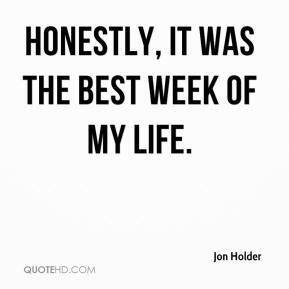 Honestly, it was the best week of my life. 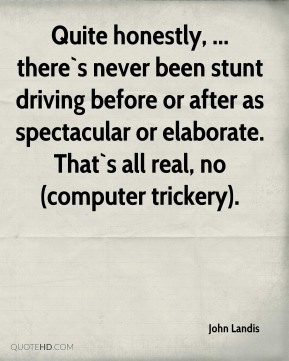 Quite honestly, ... there`s never been stunt driving before or after as spectacular or elaborate. That`s all real, no (computer trickery). Honestly, we've way outgrown that facility. 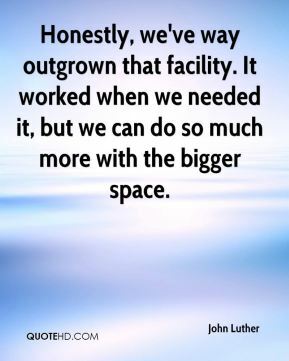 It worked when we needed it, but we can do so much more with the bigger space. Honestly, I don't pay attention to all of that stuff. Ricky and I talk about it all the time - we're complements. I don't feel under-appreciated by my team, and that's my family, they appreciate the job I do. They believe in me and I believe in them. Me, I'm dishonest, and you can always trust a dishonest man to be dishonest. 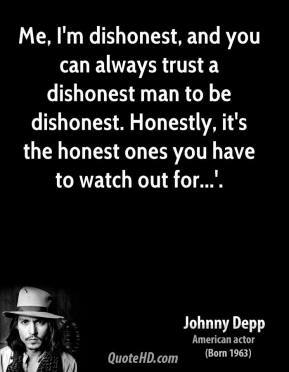 Honestly, it's the honest ones you have to watch out for...'. 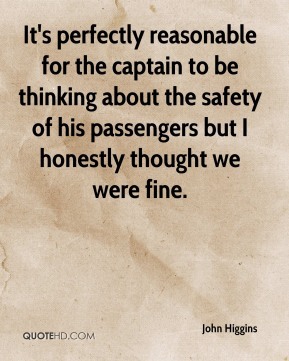 It's perfectly reasonable for the captain to be thinking about the safety of his passengers but I honestly thought we were fine. 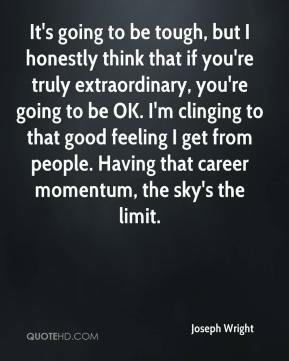 It's going to be tough, but I honestly think that if you're truly extraordinary, you're going to be OK. I'm clinging to that good feeling I get from people. Having that career momentum, the sky's the limit. Honestly, it's coming down to all these nonsensical issues that have nothing to do with bringing Jennifer home and that has caused us more stress than I can honestly even begin to share. It's my job as the captain and team leader to create shots when we need them. I honestly was looking to shoot. I knew what I wanted to do. It was just a matter of executing it. When you think about a reality show, you think about drama or bad things, but honestly, I came out of it with such a positive attitude. It helped me grow. I met some of the most diverse girls who have the most amazing hearts.